(Oregon Coast) – Spring break on Oregon's coast is a double-edged sword: it's fun but it's frenzied. It's calming but chaotic. Even more so at this time, finding a real hidden spot on the beach, with nary another soul around, is one of life's real pleasures. There are few more ecstatic experiences than stumbling upon a stretch of sand, tucked away behind some brush or squeezed between a couple of minor headlands, and finding yourself completely alone. 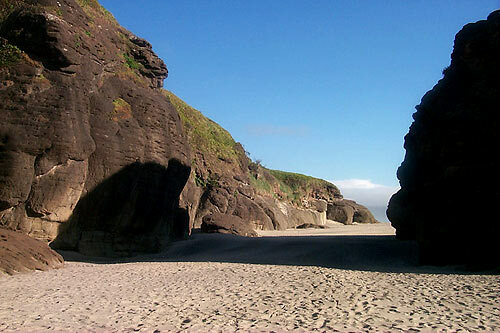 (Above: Winema Beach, near Pacific City). This is a tad more difficult on the Oregon coast during spring break than other times. Still, deserted beaches can be found. You just have to look a little harder during busier parts of the year. Here are a few hints. The Cannon Beach Less Traveled. Believe it or not, there are some parts that are less populated with people, like the very northern end, near the southern face of the cliffs of Ecola State Park, essentially Chapman Point. It takes some walking, but that's why you'll find less folks there. 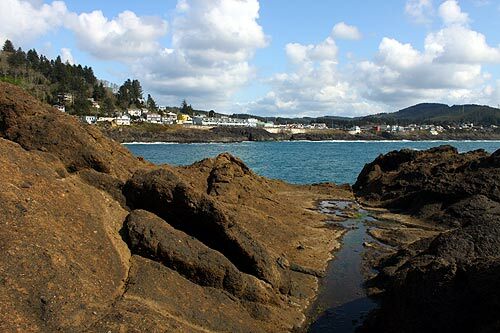 These basalt headlands are perhaps half a mile from the nearest beach access, which lies at the end of a private neighborhood at the end of 5th St. You can, however, reach it by a much longer walk from the last access downtown, from the park. If you're extremely lucky, low tides may allow you brief access to the very clandestine Crescent Beach (which you can only see from the top of Ecola State Park's viewpoints). 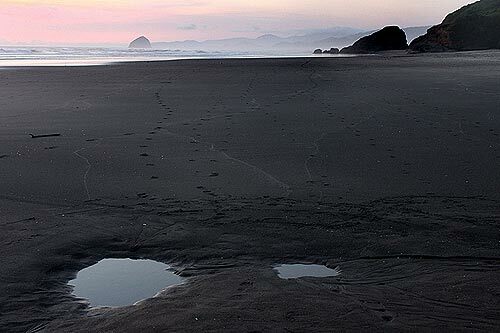 Otherwise, you can reach it via a two-mile or so hike from a gravel pullout along the road to Ecola. Secret Side of Seaside. Oregon coast's spring break king does have a slightly unpopulated side. Head to the very northern end of town, at the 12th Ave. access, and you'll discover a section of beach with usually no one around. From these dunes to the Necanicum River's mouth, it's all calm and soft sands. 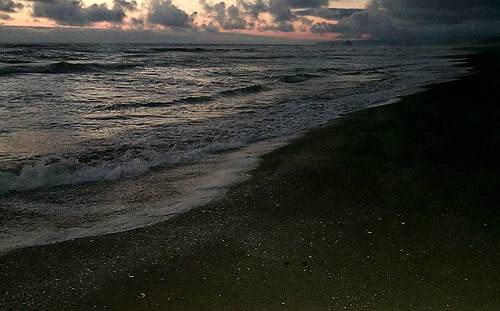 You're also quite likely to find more whole sand dollars than anywhere else. Winema Beach. It's hard to get more hidden than this. Just a few miles north of Neskowin (and even closer to Pacific City), a completely unassuming sign declares Winema Road. Follow that to the bottom and a tract of sandy beach that nearly no one knows about. 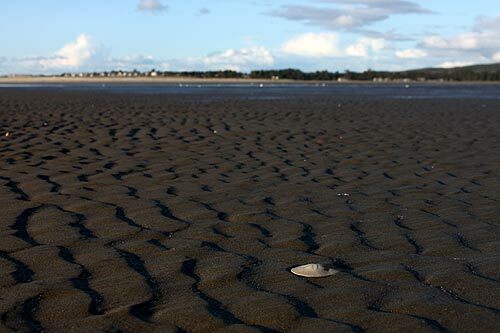 There's another blob of a rock structure that looks a bit like Neskowin's Proposal Rock to the south, which features a flat stretch at the top that's perfect for lounging. Other interesting shapes and crevices present themselves as you walk northward. Some spots in the cliffs seem to invite climbing and exploring. And there's more than one hole in the rocks to huddle from the wind and cuddle a bit. Neskowin's Truly Hidden Section. Just south of Pacific City, Neskowin is the quiet little resort that's constantly threatening to explode into something much bigger. This is also where the famed 1800-year-old ghost forests lie. For even less people, hit the very northern end. 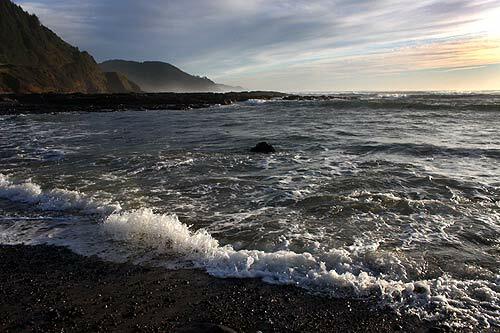 Drive the road that runs alongside the beach, where the street names turn to names of Oregon cities, and a mile past the major curve you'll find some hidden accesses. Things are starkly different here. The sand grains are much bigger and coarser, and it's completely bereft of other folks. Bob Creek Wayside. South of Yachats, and just barely south of Strawberry Hill and Neptune State Park, you'll find this almost mystical spot. More tide pools populate this obscure but fascinating place than humans. They really emerge at lower tides, clinging to odd, mushroom-shaped rocky blobs at the southern end. At this end, there's also a small sea cave and a huge boulder that together create a sort of arch by leaning up against the cliffs here. Behind Depoe Bay: North Point. A delightful and untamed bit of surrealistic shoreline lurks behind the neighborhood at Vista St., found at the northern tip of Depoe Bay. Head to its end and you'll encounter the secret headland of North Point, a stretch of basalt cliffs filled with odd patterns, strangely smooth chunks, but mostly craggy, pointy structures. From here, you can glimpse a different view of Depoe Bay and see what it looks like from the front. The northern tip has a weird railroad-like shape embedded in it, coming complete with incredible views of some wild coves. Other areas seem to form natural seats, perfect for sitting and viewing the crazed tide. There's a spot that's sunken and slightly flat, like the remnants of a basement - and a stairway-like structure formed naturally - rather miraculous, even ironic.